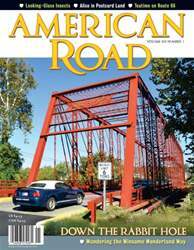 American Road® magazine's Spring 2014 issue starts with "Wonderland Way," a feature that traces a 1921 scenic route set against the shores of the Ohio River. Underground caverns, Lincoln logs, Santa Claus, and a New Albany art club named for the route are parts of its watercolor composition. So are "Peggy"—a horse turned into a Model T with wings—the nine turns up Corydon Hill, and an iron bridge to yesterday called the Triple Whipple. So pack the kids and wake the Dormouse: The Wonderland Way may be the most scenic early auto trail winding through the Midwest. The Wonderland-themed issue continues with a tribute to six larger-than-life, long-eared leapers in "Hopping the Hippety Highway"—an article to appreciate while snuggling one's own road bunny, while "Alice in Postcard Land" reinterprets the tale told by Lewis Carroll as notes from the road. 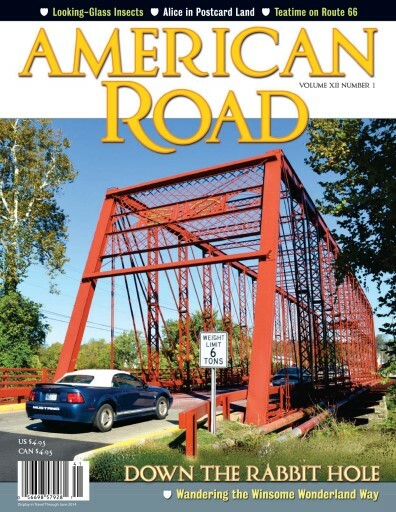 American Road® departments delve deeper into the Tulgey Wood. Staff look for big, blue caterpillars at the Sophia M. Sachs Butterfly House off US 40 and stop for tea along Route 66. On the Old Spanish Trail, one meets a president who is a tree. It's all great fun, as a gryphon might say—especially one wearing a plumage of ticklish spring feathers.